Greetings from the woods! Much has happened in the last several months. I eagerly applied for, hoped for, and was offered a new job. We went through all of our belongings, tried to figure out what we really need, and packed the rest into countless boxes headed for storage and Goodwill. D and I left our respective teaching jobs and moved Up North. We took advantage of our last long summer, celebrated with family, traveled, and checked a few more National Parks off our list. We settled in to our transitory stay at the place that was my first portal to the natural world, our family cabin in Northern Wisconsin. 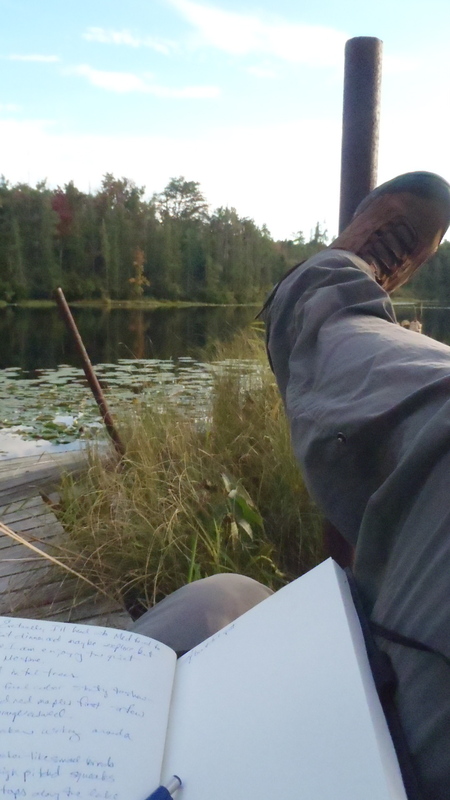 I started a new position as a Wilderness Field Instructor at New Vision Wilderness LLC, a Wilderness Therapy Program in Northern Wisconsin. I will continue to share our experiences at the National Parks of course, but inkinthebranches is an evolving entity, a shifting reflection of life’s adventures. D and I woke early to make coffee before I embarked on my new adventure. Five days of training, then my first four days in the woods. The sun beamed a pink hue across the lake, the morning fog slowly dissipating over the still surface. D called to me from the living room, instructing me to move quickly but smoothly to the picture window. A Great Blue Heron stood on the shore beside the pier. One long slender leg stood straight, the other bent at a 45-degree angle, slowly extended forward, then paused in midair. His head cocked slightly to the right, tipping his long beak down toward the water. I whispered in awe to D as we watched the svelte creature stalk the shallows. We have seen many Great Blue Heron here over the years, but mostly in the channels between lakes, never right on our shoreline. It felt like a message to me, a sendoff from loved ones gone by wishing me luck and sending me positive energy and strength as I headed into the woods. I have always felt a strong connection to birds. Their presence feels significant, even intimate at times. The summer after my grandmother passed away a docile white goose spent several days waddling this same shoreline and pecking purposefully across the yard. She wove through my family members as we watched incredulously. We all knew it was my grandmother, saying hello in a voice we knew well. Ducks and geese still roost within the cottage walls; a line of mallards and mergansers boarder the bathroom wall, while demure duck needle point and goose shaped pillows migrate through the bedrooms. This Great Blue Heron felt just as familiar, yet grander, like a celebration, welcome, or ceremony. Great Blue Heron on the pier! Photo by D.R.J. My backpack stood upright and ready in the living room, pockets stuffed and straps tightened. I swung the weight up and onto my back and headed out the door. D sent me off feeling confident and ready to start work. Me and my rig on my first day! Photo by D.R.J. The slow melody twisted along the road, the morning light braiding herself into the shadows of the swaying birch and pine. I made the final turn toward the NVW lodge and repeated the song one more time. 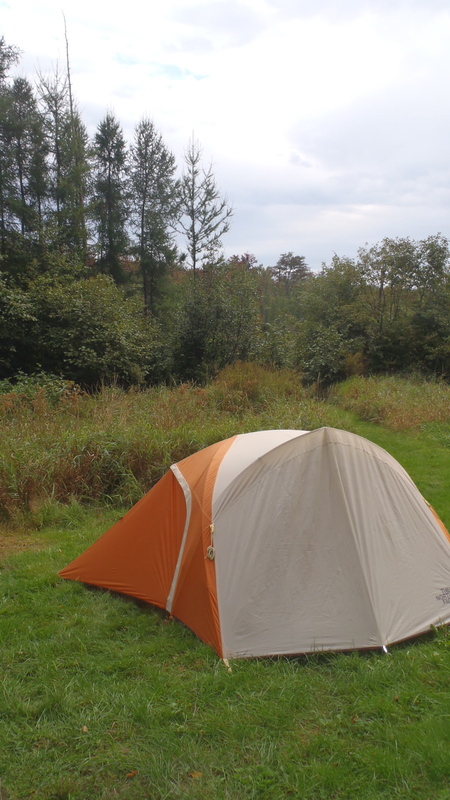 I spent the night camped near the small lake. I listened to barred owls hoot and yelp through the night and woke to the distant yawping of hunting dogs being run for the approaching bear season. 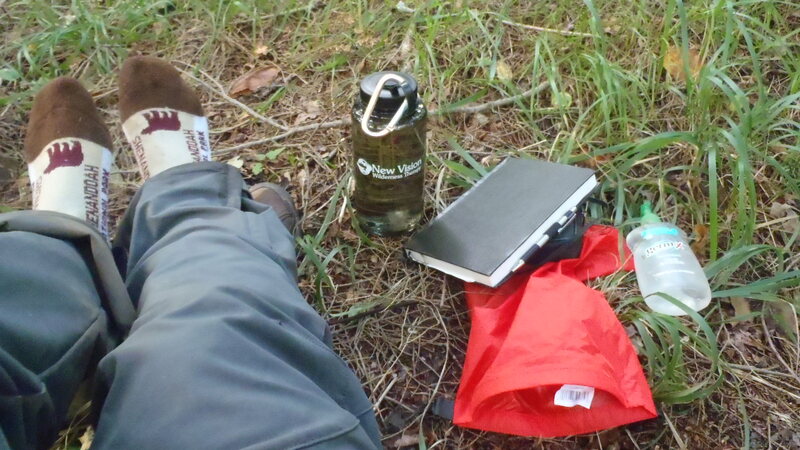 For the next four days I was immersed in the particular training required to become a Wilderness Field Instructor in a Therapeutic Wilderness Program. A combination of lectures, scenarios, Powerpoints, discussions, and hands-on practice filled the hours of each day. I was almost giddy with the glow of new information. I felt like I was in school again, my brain acute, my hand flying across my page scribbling notes and questions. One aspect of this job that has excited me since I first applied for the position was the opportunity I would have to learn. The environment at NVW is one that tries to encourage staff growth, development, and education. Everyone seems open and eager to learn, seek the expertise of others, and share their own knowledge with those who want to know. Every day was a barrage of fascinating information and intriguing people. The training ranged broadly from focusing on building of relationships, to therapeutic practices, to trauma-informed care, to psychological and scientific studies of the development of the brain and much, much more. 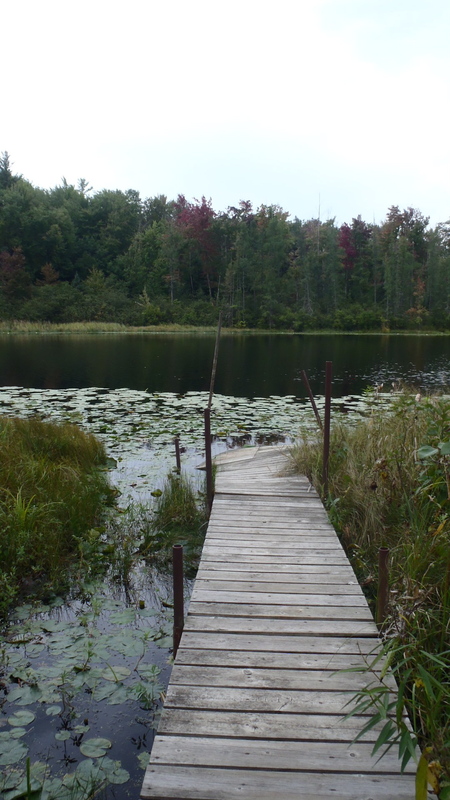 Lake behind the NWV Lodge. Two other staff in training working on bow drilling skills. The final day of training, I transitioned straight into the field. I was scheduled to work with a staff I had meet during the observation phase of my application, which I was excited about. As I drove to the trailhead though, I felt my stomach shudder and my nerves twinge. Excited, nervous, confident, and eager, all at once, I knew I needed to take a deep breath to refocus. I called on the training I had just been through and lead myself through Quick Coherence. My body relaxed, my nerves loosened, and my mind cleared. I felt refreshed, focused, and prepared. I arrived at the trailhead to meet the staff who would hike me in to camp. I strapped myself into my pack and followed my staff guide through the soggy Chequamegon. Several days of rain deepened each step in the soft forest ground. We snaked through slouching cedars and mossy mounds of partially decayed plant matter and roots. Hundreds of ferns reached their wide fronds up from the nutrient-rich floor. They nodded as my legs brushed the green bursts lining the trail. I could hear a river nearby, but could not see the water yet. Droplets of an earlier rain fell from the leaves above, ticking and tacking on the plants and ground below while the suction of mud to our boots kept steady time. We slogged swiftly through the dimming light of day toward camp. As we approached, I heard a fire crackling and smelled the rich copper sweetness of browed butter. A staff (one of NVW’s founders, actually) brought the group I was about to join fresh mushrooms he harvested along the trail to add to the dinner of beans and rice. The smoke from the fire billowed and hung around the camp. I set up my tent and joined the chow circle. My first day of work had begun. L.O.D. lead the group in Quick Coherence at the bear bags and then we headed to our camp for breakfast, to break camp, and to pack up for today’s hike. As we prepared for group movement, a student who held little confidence in her ability to hike began to express her reticence at the task for the day. A challenge of any wilderness work is the factor of the wilderness itself affecting any action or activity of the day. This can work in your favor and make for amazing experiences. This can teach lessons that can only be rendered by environment. This can also prove to be the biggest challenge of the moment at hand. The further challenge of wilderness therapy is that this all takes place in a treatment setting, or the “therapeutic milieu”. Combine this with the fact that as a Wilderness Instructor I am actually living day in day out with students for eight days at a time, in the north woods of Wisconsin. Countless issues can arise at anytime, day or night, and cannot always be anticipated. The strong working relationship and excellent communication between the wilderness staff team is key to successfully dealing with any situation. After working with my co-staff once before on my observation, we already had some understanding of one another and seemed to have established clear communication between us. 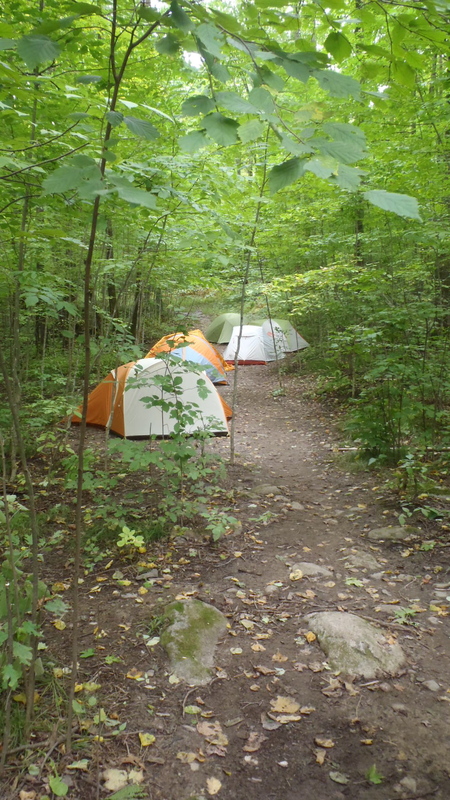 Once camp was packed and swept, I took up the front staff position to begin our movement down trail. Our hike moved at a choppy, rough pace as we stopped every few minutes to loud protests of “ I can’t do it! I CAAAAAN’T! I’m not strong enough!” I hiked behind the protests, meeting them encouraging words of optimist and confidence. We moved a few more steps and suddenly lurch forward as we stopped again. “It huuuurts! I can’t! !” It’s true. The packs are heavy. Hiking can hurt. 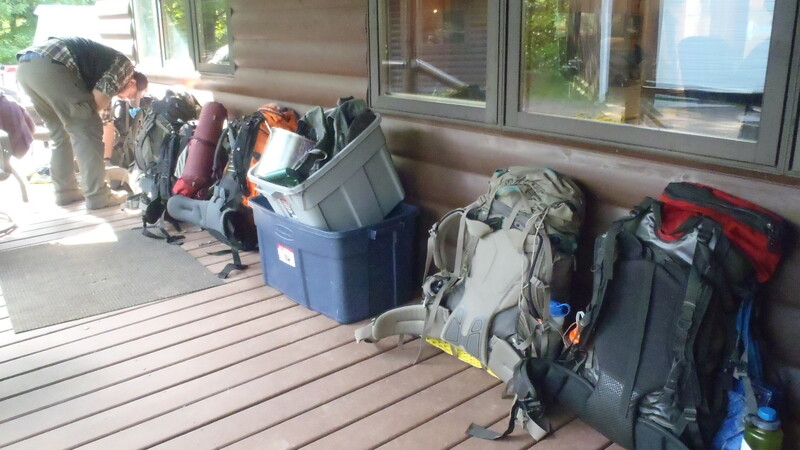 Each student must carry their own hiking bag with their tents, cloths, and personal belongings. They also must divide up the group gear (tarps, stoves, cooking pots, water dromedaries) between them along with the bear bags filled with food. Staff also carries their own packs with their full rig plus group gear that cannot be carried by the students like fuel, sharps, medication and first aid, etc. 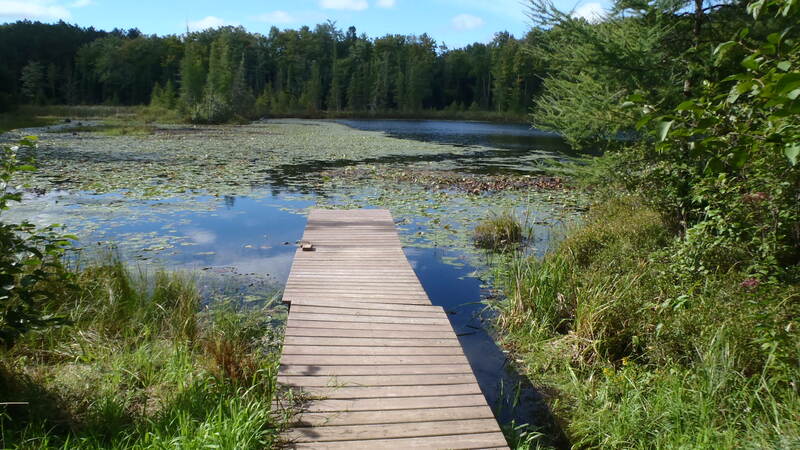 Wilderness Therapy is different than other types of treatment as the physical challenges meet the emotional and mental challenges of in-depth treatment. This is part of what makes it so fantastic. Everyone must face and confront the basic challenges of living as well as healing. We make our food and water everyday. We create our own shelter. We learn how to function as individuals as well as how to contribute to a group. 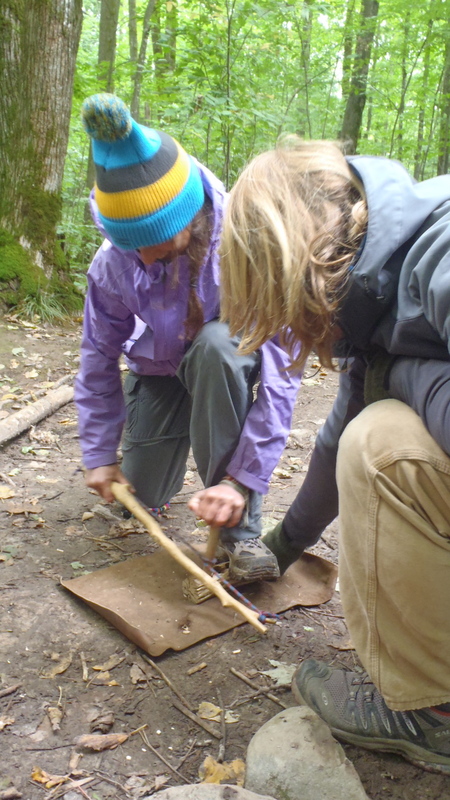 We learn how to survive in the wilderness, which of course, involves movement, struggle, change, weather, and yes, hiking. Hike days always have the potential to be a challenge. The hike continued in this staccato manner, the voice of self-doubt gaining volume with each step. It became a test of everyone’s patience and ability to encourage. This trial of my wherewithal as a new Wilderness Instructor was only surpassed by this student’s own intent dedication against herself. I have never seen someone perjure themselves so absolutely, so vehemently, and so stubbornly. As she walked, she said that she could not walk. As she hiked, she insisted she could not hike. As she moved, she protested that she could not move. The two-mile hike took a total of four hours. We finally made it to the banks of creek opposite the campsite we were aiming for. The bridge was washed out and the creek coursed along the banks. Could it be waded across? A cold snap still hung in the air despite the sun beaming through the opening in the trees. The water was moving swiftly. To wade across meant to be wet. It meant cold. It meant the possibility of lost gear. It meant an unnecessary safety risk. Wading across would be an absolute last resort, one that my co-staff and I were not ready to resign to. My co-staff went on ahead up stream to look for a place to cross. Though it would mean being wet, cold, and likely miserable, the students all individually came to the conclusion that they “just wanted to walk across”. Of course, we would not allow that unless it was absolutely necessary, which was unlikely. This is a perfect example one of the many responsibilities of a Wilderness Field Instructor: to keep the students safe. My co-staff’s voice crackled through my radio. “Lead them along the creek, the direction I headed, but be sure to go wide – it’s all stinging nettle along the water. Have them keep their arms up when possible,” she responded. I lead the way through the dense vegetation along the bank of the creek. We slogged through the muck, pushing aside the trees and vines that wove a thick barrier to our path. I brushed a spread of stinging nettled with my hand and jumped at the sting. Our trailblazer responded Marco Polo style as we reached toward the sound of her voice. She waited on the opposite bank, at the end of a long, thick tree trunk. She gestured at the bridge she found and instructed the students to carefully sidle sideways across. “What if I fall in?” someone asked. “Then you’ll get wet,” she said. The tree was more than wide enough for each student to reach the other side safely. Now it was up to them to take a measured risk. Each student inched sideways along the tree trunk, balancing precariously against the weight of their stuffed packs, each adorned with swinging bear bags and strapped with group gear. After everyone made it safely across and I followed last. Soon we were setting camp for the night. Break time – hiking boots off! I headed back to camp. Dinner was couscous-macaroni and cheese with pepperoni and carrots. Students are required to include a starch, protein, and vegetable with each meal. Sometimes this can bring interesting results, but staff is always present to confirm nutritional requirements are fulfilled. Chow and evening check-in, followed by campfire chat with my co-staff. This is our chance to process the day, complete paperwork, prepare for the following day, and discuss any events. It is also nice to unwind a bit after a long day in the woods.